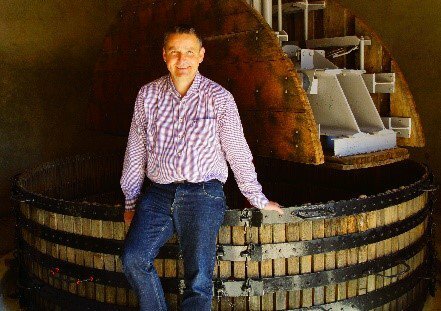 The Story began in 1983, when Jean-Luc SECONDE, son of champagne winemaker, decided to start his own business in the heart of the vineyard of Montagne de Reims, in the village of Ambonnay. From the beginning, he was supported by his wife, Catherine. Today, the Vineyard has expanded and covers 6 hectares only planted in Grand Cru. He dug the cellars out by hand himself under the family home. A real feature which signs Champagnes with a strong identity. Today, the destiny of the assisted-Simon House is in the hands of Jérôme Bôle, the son-in-law of Jean-Luc and Catherine SECONDE. Nicolas SECONDE, oenologist and son of this Champagne House help Jérôme in the winemaking process. Nicolas, the sparkling wine specialist, is involved in many wineries in France and abroad. His expertise is necessary to produce and maintain a unique style: that of Champagne SECONDE-SIMON. The soil of AMBONNAY is implanted on hillsides where the limestone is flush with the surface of the ground covered with a thin layer of chalky-clay. The hillsides of AMBONNAY-BOUZY benefit of a South, South Eastern exposure. The particular geological and pedological conditions, as well as the local microclimate, create the necessary characteristics to obtain exceptional grapes.